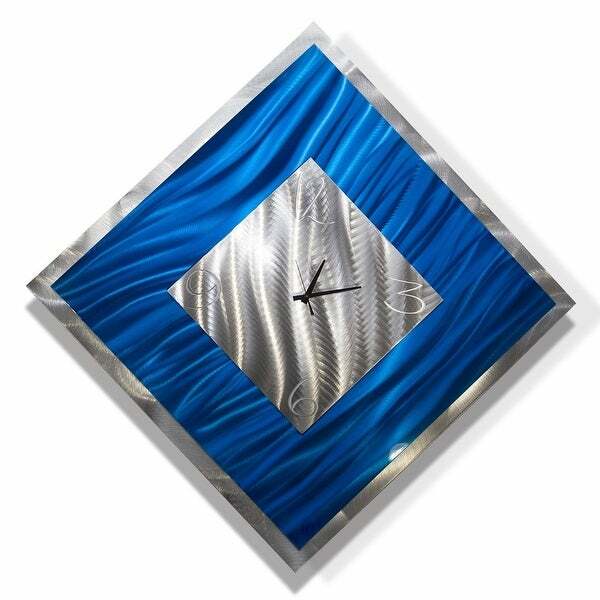 Statements2000 Handmade Metal Wall Clock Art Modern Blue Silver Accent Decor by Jon Allen - Blue Ice Clock - 33" x 33"
Jon Allen is the premiere metal artist. After more than 15 years and thousands of original designs to his credit, Jon's work can be found in the homes of private collectors all around the World. His art has been featured in countless television shows, blockbuster films, and is displayed in luxury hotels, restaurants, corporate campuses, and other spaces worldwide. Each piece is handmade with care and signed by the artist here at Jon's Statements2000 studio near West Palm Beach, Florida. For customer service inquiries or to initiate a return, please contact Statements2000 at studio@statements2000.com or 561-249-1587. You can initiate a return for new and unopened items within 60 days of delivery for a refund. To qualify for a refund, items must be in new and unused condition with all original materials and/or accessories. If a return is not received at our processing facility within 30 days, it may be subject to a partial refund. You will be responsible for return shipping costs. However, if the return is a result of a fulfillment error, product defect, or damage incurred during shipping, we will refund the full cost of the merchandise. We will provide a pre-paid return shipping label for Non-Buyer's Remorse returns. All returns are subject to inspection, and if found not to be an error on our part, the return shipping costs will be withheld from your refund. Statements2000 Blue / Silver Metal Wall Clock Art Modern Accent Decor by Jon Allen - Spare Moment - 17" x 17"
Statements2000 Handmade Metal Wall Clock Art Abstract Black Silver Decor by Jon Allen - Allay Clock - 17" x 17"
Statements2000 Silver Metal Wall Clock Art Modern Silver Accent Decor by Jon Allen - Light Source Clock - 24" x 10"
Statements2000 Handmade Metal Wall Clock Art Modern Aqua Silver Accent Decor by Jon Allen - Ocean Energy - 24" x 9"
This fully functional metal wall clock art will complement any modern, abstract or contemporary home decor. Unique styled pre-installed brackets allow for vertical display, and 'float' the artwork off the wall approximately 2 inches for added eye catching depth and dimension. Easy mounting instructions included. Due to a wide variety of wall types, nails / screws are not provided. All clocks are quartz movement tested for time accuracy. Batteries included. Each clock is signed by the artist, Jon Allen and includes a Certificate of Authenticity. Dimensions 33.0 In. X 2.0 In. X 33.0 In. Statements2000 24-inch Metal Wall Clock Art Modern Black Silver Decor by Jon Allen - Elegant Mechanism - 24" x 24"
Statements2000 Blue & Silver Modern Metal Wall Clock Art Decor by Jon Allen - Crest Clock - 24" x 12"